I am writing to you as a mother and advocate for Fed is Best. You may have seen the story of Landon Johnson, who was welcomed into the world by his parents in February 2012. Like most new parents, Landon’s mom and dad were lead to believe that Jillian would produce enough breast milk to meet Landon’s caloric needs. The hospital where they delivered was “Baby-Friendly” and would only provide formula with a doctor’s prescription. 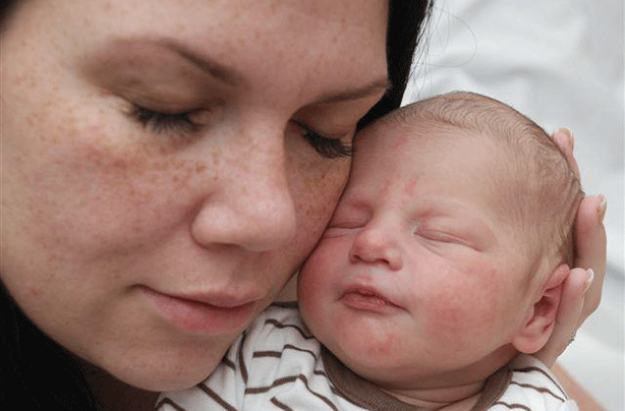 While in the hospital, Landon cried whenever he was not latched onto his mom’s breast. Jillian described him as inconsolable. She was told that this was normal. At less than 3 days of life they were discharged from the hospital after having the appropriate number of wet and dirty diapers. However, less than 12 hours later, Landon was readmitted to hospital after suffering cardiac arrest due to severe dehydration. He suffered brain injury and ultimately died in the arms of his parents when life support was terminated. His is a story that you cannot read without tears in your eyes. 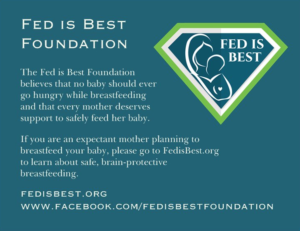 Because of the Fed is Best Foundation, I learned about the risk of accidental newborn starvation and my husband and I were able to come up with a plan to reduce the possibility of any adverse health outcomes while we waited for my milk to come in. Almost 5 years to the day of Landon’s birth, on February 22, 2017 we welcomed our daughter to the world. After considering all the risks and benefits, we made the informed choice to supplement in the first days of life. After each nursing, my husband offered a bottle of formula. In this manner, we were able to minimize her weight loss. Interestingly, she did not go through the “second night” of crying that we were warned about. In fact, she rarely cried but instead ate and slept, no doubt because she had a full tummy from our supplementing efforts. She remains, to this day, a happy breastfed baby. 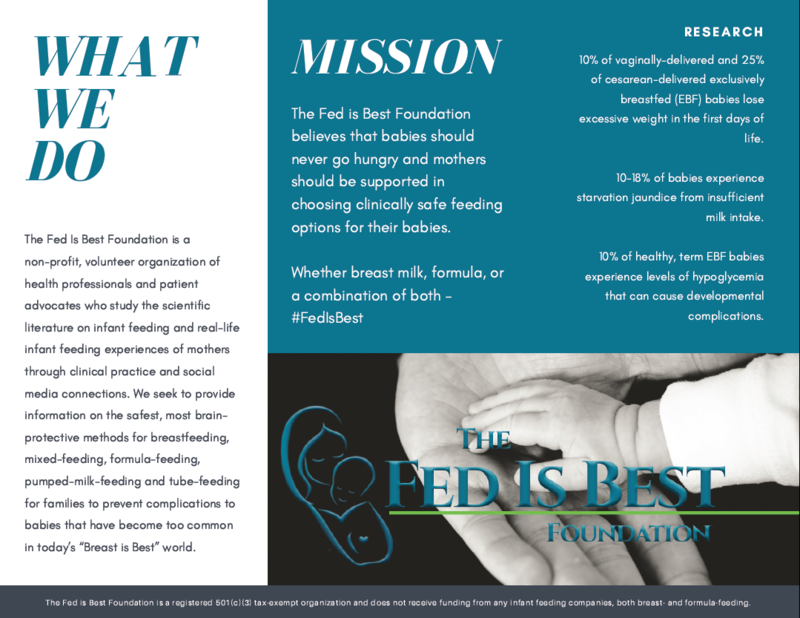 The goal of the Fed is Best Foundation is to ensure that no newborn suffers complications while they wait for mother’s milk to come in. Landon’s parents tell the story about how just one bottle could have saved him and that is the message that the Fed is Best Foundation wants to spread: that just one bottle can protect a newborn from potentially serious consequences from being underfed. 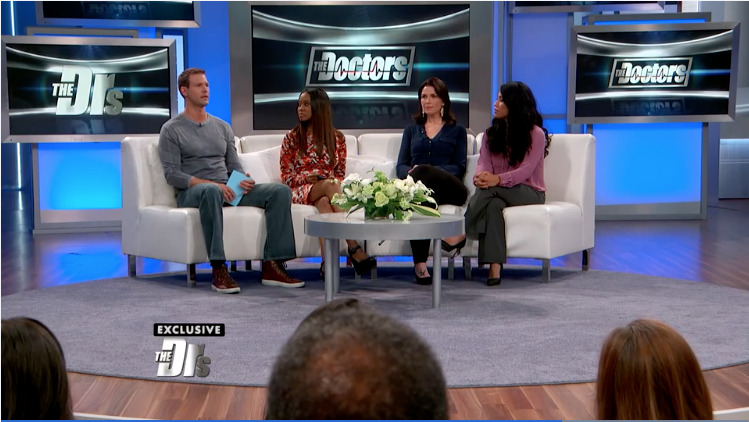 Jillian Johnson and Dr. Christie del Castillo-Hegyi, Co-Founder of the Fed is Best Foundation, recently spoke about Landon’s story and the importance of being aware of the signs of accidental infant starvation on the Doctors Show. Insufficient breast milk is common, especially in the first days of life. 22% of motivated, lactation-supported exclusively breastfeeding mothers experience delays in copious milk production that increase the risk of excessive weight loss in their newborns by 7-fold. 10% of healthy, term vaginally-delivered and 25% of cesarean-delivered newborns develop excessive weight loss of > 10%, which increase the risk for excessive jaundice (hyperbilirubinemia), hypernatremic dehydration and hypoglycemia, all known causes subtle to severe impaired brain development. A glucose of less than 46 mg/dL within the first 24 hours of life has been associated with a 3.7-fold increased risk of brain injury on MRI and a 4.8-fold increased odds of lower motor, cognitive and language scores at 1 year of age. Cognitive impairment from hypoglycemia can have life-long effects as evidenced by a study of 1395 newborns showing that newborns who develop transient hypoglycemia of less than 40 mg/dL had a 50% reduction in passing their fourth-grade proficiency test in literacy and math. Even a glucose less than 45 mg/dL resulted in a 38% reduction in passing the literacy test. 12-35% of well-monitored EBF newborns develop hyperbilirubinemia and 5.7% of newborns born in hospitals with high exclusive breastfeeding rates require phototherapy. [10-18] The majority of hyperbilirubinemia is caused by non-hemolytic jaundice from insufficient feeding. In comparison, a recently published study showed freely supplemented breastfed newborns have a hyperbilirubinemia rate of 1.3% and a phototherapy rate of 0.3%. A recently published study showed that 36% of healthy, term breastfed newborns develop hypernatremia (>145 mEq/dL), which can occur by 4.8% weight loss, a complication that is a known cause of injury to the brain and vital organs and increases the risk of developmental delay, disability  and rare death in previously healthy newborns. The Fed is Best Foundation would like to offer you printed materials to make available to your patients so that they can learn about the potential negative health consequences of underfeeding and how to prevent feeding complications through the Fed is Best Foundation parent resource page (fedisbest.org/resources-for-parents). 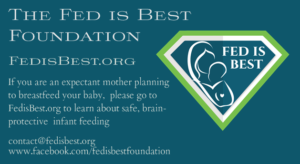 If you are interested in helping your patients learn how to best feed their babies safely, through exclusive breastfeeding, formula-feeding or any combination of both, please consider counseling them on the importance of prioritizing the health and safety of their babies through adequate feeding and please email the Fed is Best Foundation with your mailing address at contact@fedisbest.org to receive our educational material. We want to thank Dr. Christopher Zahn, Vice President of Practice Activities for the American College of Obstetricians and Gynecologists for responding to our letter regarding safe support of breastfeeding in the newborn period and inclusive support of all mother’s informed infant feeding choices. We thank you for endorsing that Obstetrician-Gynecologists and midwives provide counseling on when a mother should seek help regarding breastfeeding problems. We are encouraged by your support of providers maintaining knowledge and skills on normal breastfeeding physiology and management of breastfeeding complications, including anticipatory pre-hospital discharge feeding guidance for mothers on those matters. We, too, feel that providing mothers the tools to recognize safe and unsafe conditions in their infants during the course of breastfeeding is critical to providing safe and ethical breastfeeding support. 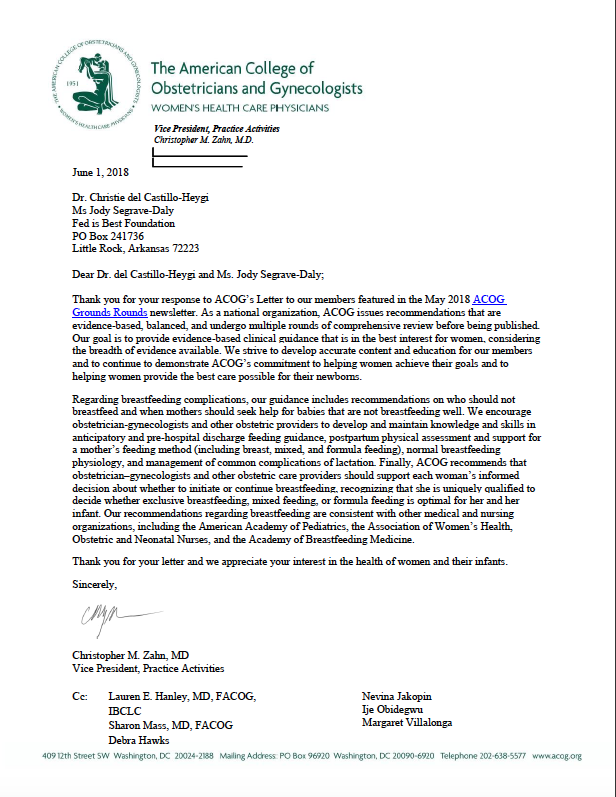 Most of all, we are so grateful for ACOG’s recommendation that Obstetrician-Gynecologists and other obstetric care providers support each woman’s informed decision about what form of infant feeding is best for her child, whether it be exclusive breastfeeding, mixed feeding or formula feeding. 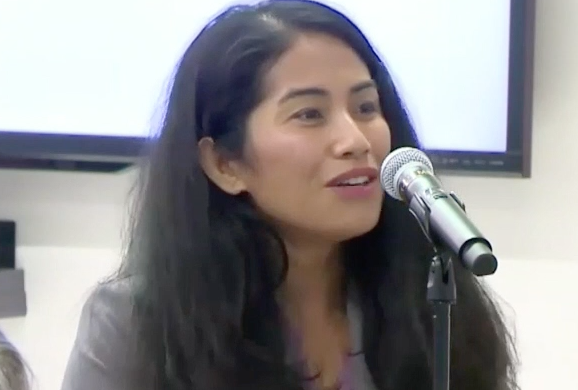 We, too, believe that mothers are uniquely qualified to determine what optimal nutrition looks like for her child depending on breast milk supply, anatomy, infant nutritional needs and the complex social, psychological and economic realities of the family unit. Thank you for your continued support of mothers and their infants as well as the health providers that care for them. Note: We are offering U.S. health care providers printed business cards, postcards and brochures sent by mail for free while supplies last. You may opt to donate the shipping and printing costs or any amount to help support the educational outreach efforts of the Fed is Best Foundation. We are also offering this printed material all over the world at the cost of printing and shipping through VistaPrint, an international shipping company. You may also choose to print out your own promotional material for your patients by clicking on the downloadable material below. Please contact us at contact@fedisbest.org. Thank you so much for your support.